Entertaining guests can get expensive and be time-consuming – especially on St. Patty’s Day. Don’t feel like going out to a club or on a bar hop? This fun DIY project will keep both you and your friends entertained. 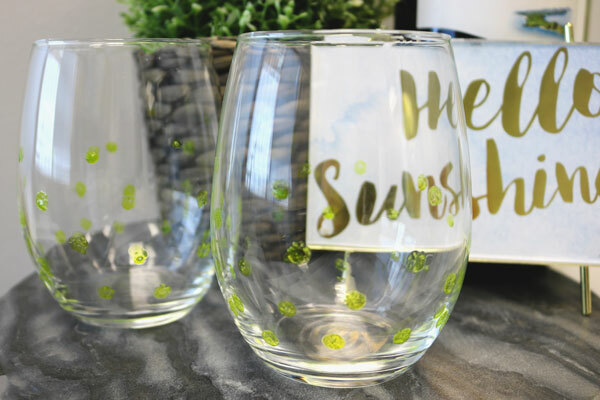 Ditch the beer and go for a Green Sangria wine cocktail to pair with your elegantly designed DIY glasses (Recipe Below). Your guests love getting creative! Make them for yourself and have a ball! P.S. Since everyone has unique styles, each glass will look different, so you will always know which one is yours – no more Red Solo Cup mix ups! They bring a spunky pop of colour to any get-together and spruce up your table setting. 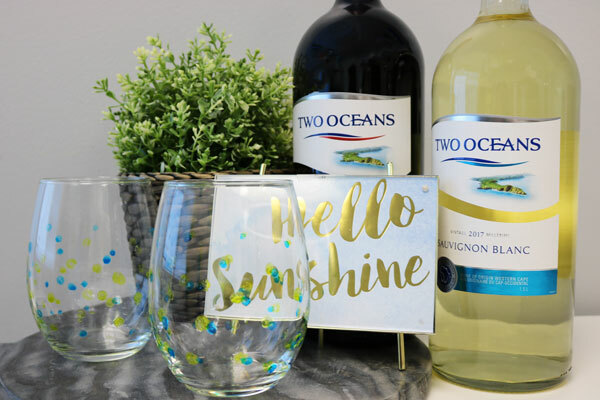 You can even send your guests home with the glasses as little party favours, always reminding them of how great a hostess you are every time they use it. 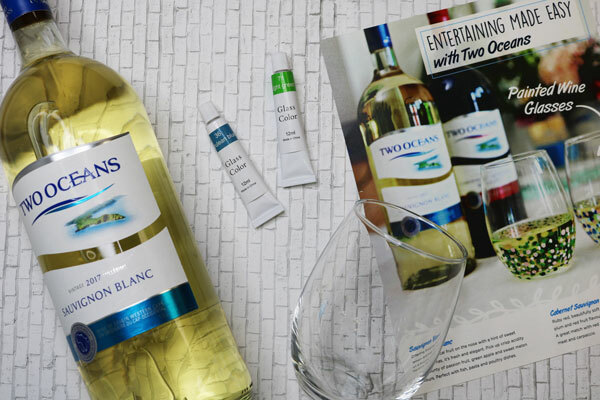 Clean your glasses – Wash your wine glasses with soap and water and dry them with a clean paper towel. Choose your colours – inspired by both St. Patrick’s Day and spring, we used blues and greens – but feel free to add your favourite accent colours. 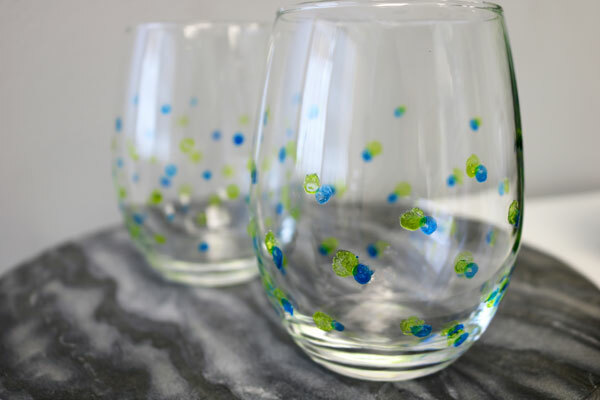 Use cotton swabs to dab paint onto the glass – Start with one colour to create a base of dots on the glass. Let each colour dry for about 5 minutes before moving onto the next. Use varying pressure to create different size dots, overlapping colours for an interesting pattern even! Bake your glassware – Once the paint is dry, place glassware into a cold oven and turn on to 350 degrees. After 30 minutes, turn the oven off and allow glasses to sit inside for one hour. Voila! After your glasses are done, fill them up to the brim with this fabulous Green Sangria St. Patty’s Day recipe! Share your creations with us on social media! 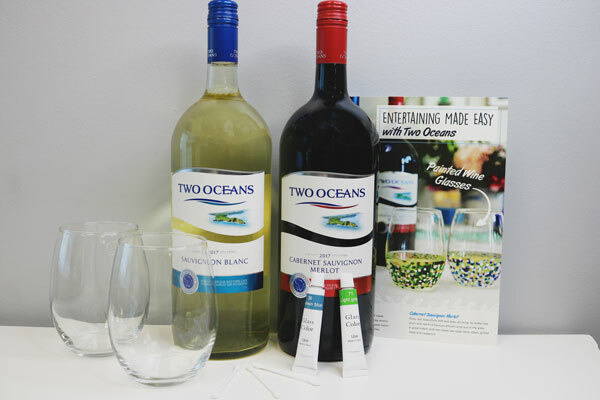 Thank you Two Oceans Wine for providing us with the contents to create this post.